Don’t forget to visit the rest of the posts for this awesome meme hosted by ChapterBreak.net! And the lovely graphic is by The Lovely Pages Reviews. Today’s topic is a super fun one! I’m a huge supporter of colorful secondary characters in books, so I had a difficult time putting this too-short list together! 10. Lily in The Cinderella Moment. This is a great, classic, switching-places YA, and Lily is the quirky best friend whose head I’d love to peek inside. 9. Primrose Everdeen in The Hunger Games. We only ever see Primrose through the eyes of her big sister, so seeing who Prim is around other people would be interesting. 8. The Lasalle boys in Of Breakable Things. This family of super fun boys enjoying the afterlife is cool on so many different levels. I’d love to see a book from any of the boys’ points of view. 7. Emily Young in Twilight. Now, I’m not a huge Twilight fan, but I’d actually love a book that dove deeper into the Native American culture through Emily Young and Sam Uley’s relationship. 6. 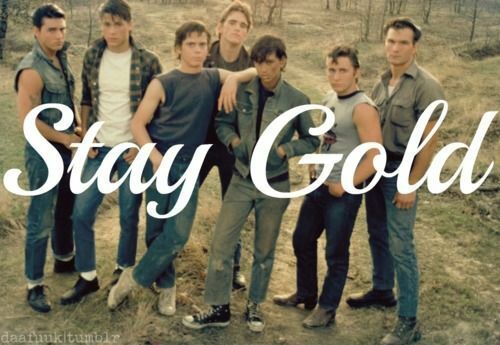 Johnny in The Outsiders. I had a crush on pretty much every greaser, but I’m fairly certain Johnny’s mind would make for the most interesting read. 5. 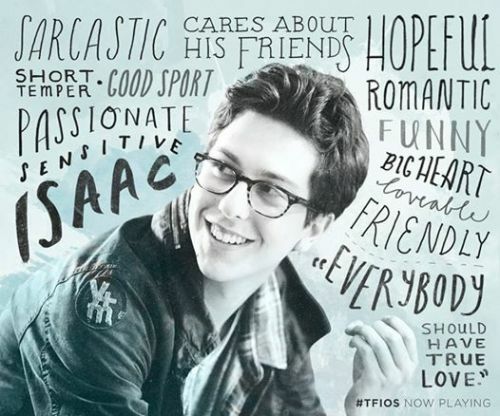 Isaac in The Fault in Our Stars. Isaac was a really funny and clever character who underwent a devastating life change. I’d love to see his story through the lens of his own dark humor. 4. Ginny Weasley in Harry Potter. To be honest, I always felt like Ginny was an incredibly flat character considering the important role she played. A book from her point of view would certainly help! 3. Samwise Gamgee in Lord of the Rings. I would love a book from Sam’s point of view! He’s such a cool guy! The ultimate BFF. 2. Moaning Myrtle in Harry Potter. Wouldn’t you love to hear firsthand about her time alive? 1. Gollum in The Lord of the Rings. Okay, this might be a little annoying considering how Gollum speaks, but think of the character arc! Hobbit to Gollum? That’s a bigger fall than Walt in Breaking Bad! What characters would you guys love to see score their own book? As always, make sure to check out the rest of the Top Ten Tuesday lists on The Broke and the Bookish! It’s no secret I love YA books, and I’ve read a ton of great books this year. But there was one that blew me away with its uniqueness. So today, I give you, Akiva, from Daughter of Smoke and Bone. If you haven’t checked this one out, I strongly urge you to do so! Don’t forget to visit the rest of the posts for this awesome meme hosted by ChapterBreak.net! For me, this is definitely “Books I Would Reread in an Ideal World,” because there are too many great new books out there for me to have much time to reread. 10. The Woman in White. I had to read this for school, which automatically makes me enjoy something less. But I loved this book! I really want to reread now that I don’t have to take weekly tests on it. 9. Anna Karenina. I read this once on a whim and I enjoyed it way more than I thought I would! So I’d really like to reread it to pick up everything I missed the first time around. 8. The Princes of Ireland (The Dublin Saga). As I’ve blogged about extensively, I’ve lived in Ireland on and off for years (I’m American by birth). But before all that was even the germ of a thought, I read this two-part series that covers Irish history in some fascinating leaps and bounds. 7. The Hobbit. I read this very young (I was proud to be an advanced reader–a little too proud), so I’d like to reread to see everything I (most definitely) missed. 6. Daughter of Smoke and Bone. This YA was unlike anything I’d read before. And it made me desperate to visit Prague. Can’t wait to visit this world again. 5. To Kill a Mockingbird. We read this in seventh grade, and I remember there was some parental discussion about whether we were too young. I’d like to reread it just in case I really was too young to fully appreciate such an influential book. 4. The Diary of a Young Girl. I was recently fortunate enough to visit Amsterdam and the Anne Frank House, so I’d like to reread this with the new context of this moving experience. 3. The Hunger Games. I really thought I’d get around to reading these before the Mockingjay Part 1 movie comes out, but the chances are looking slim. But I will definitely get to these before Part 2! 2. The Chronicles of Narnia. It’s been a long time, too long, since I read this series of epic adventures. What books do you guys love to reread? As usual, make sure to check out the rest of the Top Ten Tuesday lists on The Broke and the Bookish!